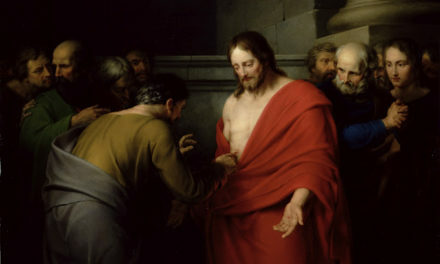 IN the Gospel of the previous Sunday, we noted that in the Old Testament, the people’s response to God’s initiative is expressed in their keeping of his commandments which, according to Jesus’ summary, are summed up in the one commandment of loving God with all of one’s heart, mind and strength, and of loving his neighbor as himself. 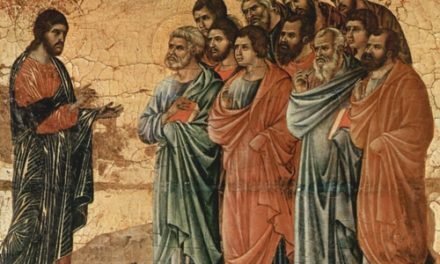 In today’s Gospel, Mark tells us the story of Jesus’ denunciation of the scribes and his observation on the crowd who put their money into the treasury of the temple. 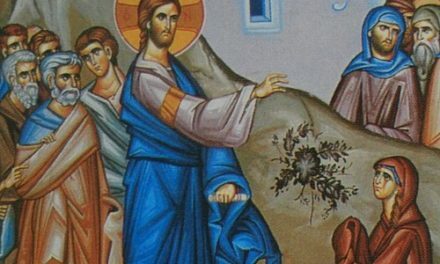 What is of much relevance to us is the second, where a poor widow put in two small coins, for this story is connected with the point stressed in the Gospel last Sunday. This pericope considered as an independent story—probably of almsgiving—that Mark used in writing his Gospel, the widow represents what is best in the piety of the Old Testament. She placed all her two copper coins in one of the thirteen trumpet-shaped receptacles for offerings in the Court of Women in the Jerusalem Temple. In doing so, she demonstrated that, poor though she was, her love for God out of her whole heart, soul, mind and strength. She gave all she had to live on (Mark 12:44). 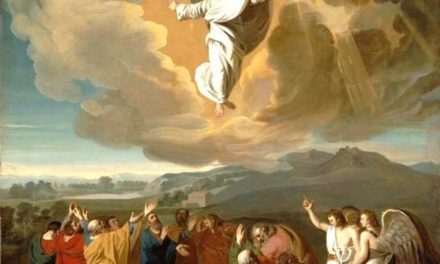 In addressing his followers, however, Jesus appropriated this story as a lesson of discipleship. To begin with, in the Old Testament, a woman was a dependent creature, either on her husband or her father. But she could not inherit from her husband, and in the early period of Israel’s history, she was part of the inheritance of the eldest son. We mention this to indicate how poor the widow was at the time of Jesus. In using this story, Mark was able to present two contrasting pictures: the poor widow and the rich man (Mark 10:17-32), and the poor widow and the scribes (Mark 12:38-40). Whereas the man who wanted to follow Jesus and who was rich could not, after having been challenged by the Lord to get rid of them, part with his riches, the poor widow gave all she had. Having much wealth, the man depended on it; and his wealth stood in the way to discipleship. On the other hand, the widow had nothing to lean on except God himself; and it was easier for her to give everything she had. For Mark, this illustrates the truth that only a truly poor person can walk in the footsteps of Jesus. Wealth is a hindrance to it. A poor one, on the other hand, entrusts himself totally to God to care for him. In the second contrast, the story of the poor widow immediately follows Jesus’ denunciation of the scribes: “Beware of the scribes who like to go around in long robes and accept greetings in the marketplaces, seats of honor in the synagogues, and places of honor at banquets. They devour the houses of widows and, as a pretext, recite lengthy prayers” (Mark 12:38-40a). For Mark, the scribes were people who were knowledgeable about the commandment of love of God and neighbor, and it is for this knowledge that they were accorded honors at banquets, marketplaces, and presidential tables. And yet, they did not put into action their knowledge of the law. Indeed, instead of showing God’s love by giving to the poor, they exploited them, like the widows whose houses they devoured. On the other hand, the widow might not have been as knowledgeable about the law as the scribes, yet, she took it to heart. Instead of exploiting others, which she could not do, she gave everything to God. She trusted in him, not wealth. Indeed, she could have kept the other coin, and gave only one to the temple treasury, but she did not. Both contrasts make it clear that all men are capable to responding to God’s generosity by being generous in love. A person, no matter how poor, like the widow, has always something to give. But an even more important point is that the greatness of one’s response is not seen in the amount that is given, for a wealthy man can always give from his surplus. Rather, what is decisive in the generosity of one’s response is the amount that is left. 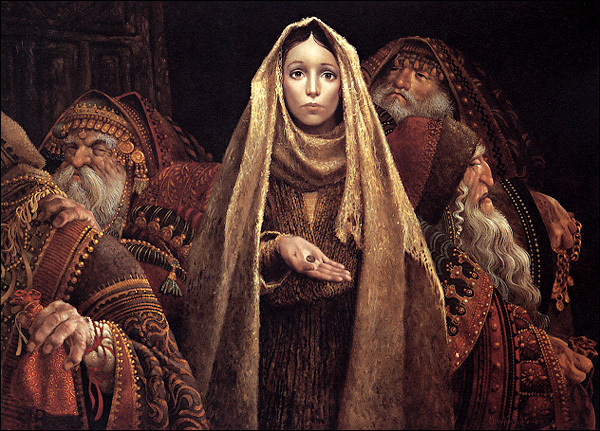 Hence, Jesus’ comment on the poor widow: “Amen, I say to you, the poor widow put in more than all the other contributors to the treasury. For they have all contributed from their surplus wealth, but she, from her poverty, has contributed all she had, her whole livelihood” (Mark 12:44). This is what discipleship really entails. Like the poor widow, we have to give up everything to follow Jesus in his footsteps. After all, Jesus gave all of himself for us at the cross.